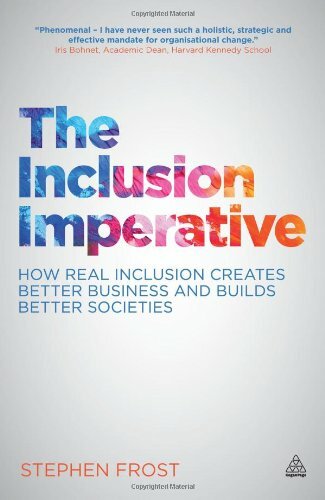 A few months ago I was invited to a talk by Stephen Frost, author of the new book titled, The Inclusion Imperative: How Real Inclusion Creates Better Business and Builds Better Societies. Unfortunately I wasn't able to make it; however, as luck would have it, a colleague suggested that I read the book and gave me a copy. 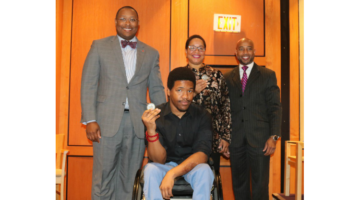 The Inclusion Imperative is an honest and up close account of Frost's experience as the Head of Diversity and Inclusion for the 2012 London Organizing Committee of the Olympic and Paralympic Games (LOCOG). In it, Frost discusses how the organization delivered on their diversity and inclusion obligations. In four sections, Courage, Creativity, Talent and Legacy, Frost takes the reader through an organizational change journey, sprinkled with compelling explanations for the business case for inclusion, practical applications, leadership challenges, and personal stories. Point 1: Diversity is a reality. Inclusion is a choice (Page 83). In my experience often times people assume that the presence of what they consider “diversity” is enough. However, “diversity” by no means equals “inclusion”. Frost also shares that inclusion does not guarantee diversity. Inclusion may be afforded to some instances but not others. Making a choice to be inclusive must be intentional. It underscores that diversity is a means to something and not the end of the story. Frost outlines how inclusion as a choice was realized through the 2012 LOCOG as a case study. Point 2: Diversity and Inclusion are leadership issues (Page 127). In any organization, individuals view and define diversity in multiple ways. Some are on board while others see no value in a diversity and inclusion agenda; and therefore keep their distance. Some think it’s about political correctness, policing people and putting out fires. Or, maybe it’s about social responsibility, talent management, and human resources. But, I agree with Frost: It is a matter of leadership, not management. To convey a singular message that motivates all members of the organization to do their part in advancing diversity and inclusion because everyone understands that doing so adds value to the organization and makes strategic sense, is inclusive leadership. Frost's example of how this was achieved at the 2012 LOCOG can be instructive for both private and public organizations. Point 3: Real Inclusion (Inclusion 3.0) (Page 57). Diversity as compliance or training has had limited success in forging systemic change. Frost argues that Inclusion 3.0 is the optimal place for organizations serious about Diversity and Inclusion. Diversity 1.0 is the basic compliance level that is seen as a necessary evil that was required at one point in time but we have moved beyond this framework. Diversity 2.0 is the infamous required or "volun-told" training that people dread because it never leads to real organizational change, at least not by itself. 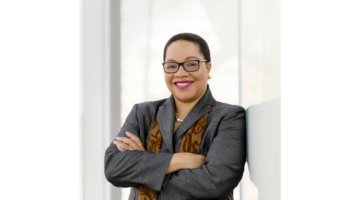 Frost’s Inclusion 3.0 is a systems approach that situates diversity and inclusion as a strategic advantage and inclusion framework to embed throughout the organization. The key is to remove barriers to inclusion so that all members of the organization can be their true selves; their best selves. Counter Point: Diversity 101… “‘Diversity Officer’ in an organization… analogous to ‘Conflict Officer’… The absence of focus on inclusion is profound.” There are many other excellent points made by Frost. Nevertheless, I do take issue with Frost's critique of Diversity Officers and the limitation of these roles in organizations. Maybe, Frost has not been exposed to Chief Diversity Officers (CDOs) who have had similar mandates as he, a mandate to remove institutional barriers, advance diversity and inclusion using a systemic approach, address policies and practices from an EDI lens, and be a leader/change agent. In the corporate world, CDOs tend to be strongly associated with the Human Resources function, procurement, etc. In the higher education sector, especially institutions that are serious about diversity, it is not a Human Resources role but much broader, based in an organizational change, systems approach that incorporates multiple rationales, including social justice and business case explanations. That said, it is unfortunate if the hands of CDOs are tied because they’ve been relegated to a back office in HR and given no authority to lead. The Inclusion Imperative has something for everyone. For executive leaders or those new to the Diversity and Inclusion profession, it is a definite read, especially those in the business/corporate sector. Frost's reporting of data and research helps anyone who is working on developing an inclusion strategy. 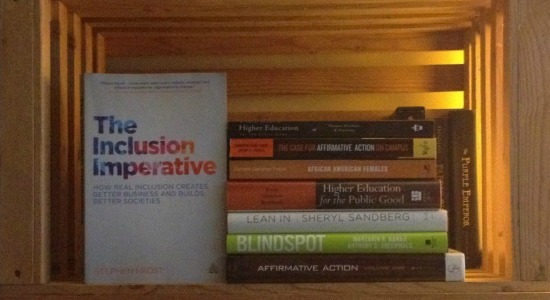 For those like myself, who are from the higher education sector, the book adds to the chorus and volumes of diversity research that is decades old; however, Frost frames diversity and inclusion in new, compelling ways that can aid our mandates and give it new life. Overall, I highly recommend the book. Feel free to leave comments below*, and I'd love your input. Thank you for this. I especially like the commentary regarding the role of the 'Diversity Officers' in organizations. Some organizations may align this position within the Human Resources function for practical reasons, such as 'reporting relationship', and not necessarily functioning as an HR practitioner. The broader role can still be in propelling organizational change management strategies. I agree that the person who has been appointed to carry out this important role be a 'leader/change agent'. Indeed, some organizations in the corporate sector may align this role within an HR function just to show that they have a 'diversity and inclusion' interests, but where real change and progress can be slow. Therefore, I strongly suggest that organizations endorce the position of 'Diversity Officers' in a serious way, giving it the freedom, flexibility and strength to bring about the change that is so needed in enhancing the 'inclusion' imperative. The 'leader/change agent' must be empowered in a leadership capacity for real change to take place. Thank you for your comment. I find the Diversity Officer’s role spans a wide spectrum, from a Complaints Officer or “PC police” to Strategic Leader or “Change Agent”. Unlike the CEO (Chief Executive Officer), CFO (Chief Financial Officer), CIO (Chief Information Officer) or CAO (Chief Academic Officer), the CDO (Chief Diversity Officer) can fall anywhere along this spectrum. There really should be a minimum or standardize set of expectations/functional roles assigned to Diversity Officers/CDOs such that walking the talk is understood as a strategic advantage.